I have a large tea pot or watering pot. I think the piece is old, but I have no clue as to its origin, or anything else about it. My wife loves this piece. The photos do not show the detail well on the pot itself. If you require more detailed photos, we can shoot some more. Any help here is appreciated. 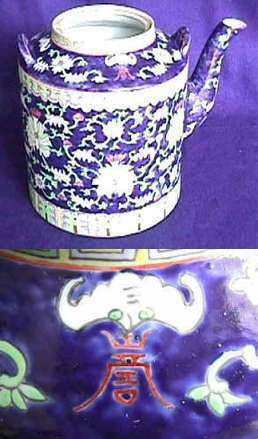 The pot is Chinese and have the look as the kind of pieces often attributed to the Qing dynasty, Tongzhi (1862-1874) period. It is unusually large, though, which make me think it first of all rather would be called a "hot water pot" instead of a teapot. The white shape above the red character is a bat - "fu", in Chinese. It is a symbol for the word "fu" which is pronounced the same way as the Chinese word for "happiness". The red character below is a "shou" character meaning "long life". Both together therefore reads "fu shou" which is a very common wish for "happiness and long life". This type of heavily enameled decoration is often confused in the West with a group of South Chinese export wares from around 1850-1930s called "Straits Chinese Porcelain". Now the typical characteristics of such wares - such as the phoenix (Feng bird), peony and the eight Buddhist emblems in the decoration are missing here and the color sheme with this dark blue enamel dominating the pieces I would say rules out true connection to that market. However, in several places in the west chinese communities used and sold many similar items and does actually up to this day why it is next to impossibly for me to suggest a firm date to your pot. For further information on the interesting subject of Straits Chinese Porcelain, though, I woul dlike to suggest "Straits Chinese Porcelain - A collector's guide", by Ho Wing Meng. Published by Times Books International, 1983, reprinted 1994 and 1996.